Here’s something interesting for those looking at surge/spike suppression and line filtering without wishing to blow the monthly mortgage payment. 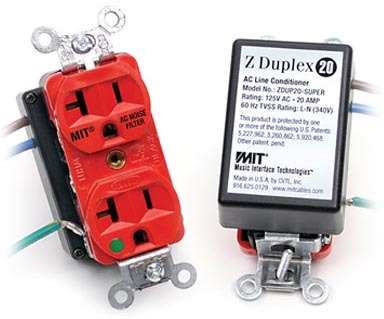 Primarily known for their network-equipped audio cables, MIT offers their Z Duplex Super, essentially a 20A hospital grade duplex outlet with built in filtering and spike/surge suppression for all of $199. The idea of filtering an outlet isn’t exactly new. Outlet manufacturers such as Hubbell offer TVSS (Transient Voltage Surge Suppression) duplex models that also have some degree of EMI/RFI attenuation and PS Audio runs baluns. MIT goes a step further by optimizing their outlet for audio/video applications with their patented parallel filtering technology. The Z Duplex Super looks like just about any other hospital grade outlet but with a black plastic case fixed to the back housing. Electrical connection is via three short color-coded pigtails. Three marettes are also included. The entire assembly will fit standard size duplex outlet boxes. Installing the Z Duplex was a snap and took me only 5 minutes. Incidentally, if you do not know how to replace a wall outlet, call an electrician. The Z Duplex Super features MIT’s "patented parallel AC filterpoles, a tuned LCR technology. MIT Filterpole technology eliminates reflected energy by efficiently attracting all forms of AC noise from the mains and discharging it to ground, converting it into harmless thermal heat. Six patented, parallel tuned filters are operating over the widest frequency range and are engineered to remove noise from any 50-60 Hz AC power line. Unlike the common series filter, the Z Duplex 20 Super will not limit dynamics or reflect noise back at the source." In one of our email exchanges, MIT VP Kent Loughlin further pointed out that the Duplex Super works in parallel with all components connected within three meters on the same circuit. Therefore, a component does not need to be plugged into the Duplex to benefit from its filtering circuit. 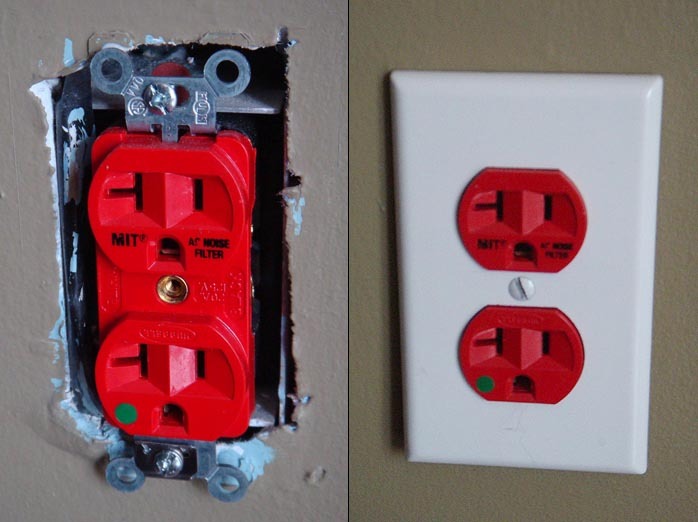 Unfortunately, the Duplex Super would not fit into the outlet box I had installed for my audio system’s dedicated line. The box I had chosen was slightly smaller than standard. However, I did pop it into a home brew power bar I‘d built several years ago to test various outlets and I did eventually install it in another nearby outlet box (on a non-dedicated line). Along with Wireworld’s Matrix power strip I still had on hand, there were a myriad connection options at my disposal. I started with digital components first and then the entire system. While I expected some improvement, I certainly wasn’t expecting what I heard - an overall quieter background in which subtle musical details were considerably more apparent; a slightly more open soundstage; more defined instrumental and vocal imaging; reduced sibilance particularly noticeable on vocals and hard percussive sounds; plus a beguiling midrange richness which really took me by surprise. The overall biggest impact was on source components, be those digital or analog. Furthermore, I did not get the sense that the outlet was in any way limiting dynamics or transient fidelity. Still I thought the optimal arrangement was running my amp directly to the Wattgate outlet and connecting my sources to the Z Duplex Super on a separate line.